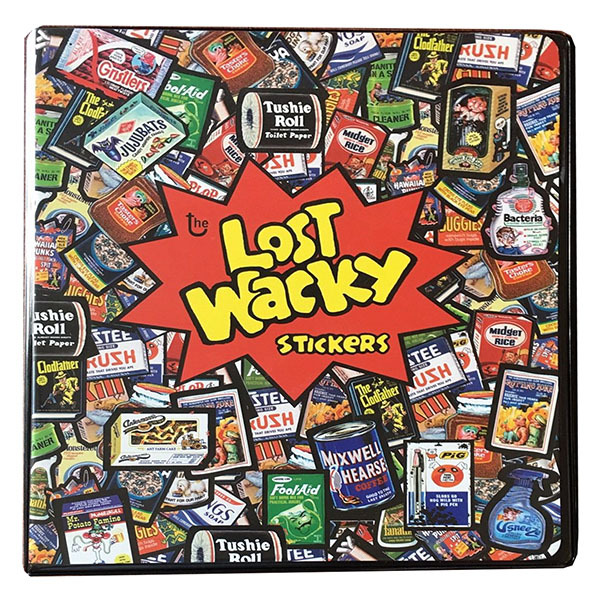 1st Series Lost Wackys was sold out almost as soon as it was printed. 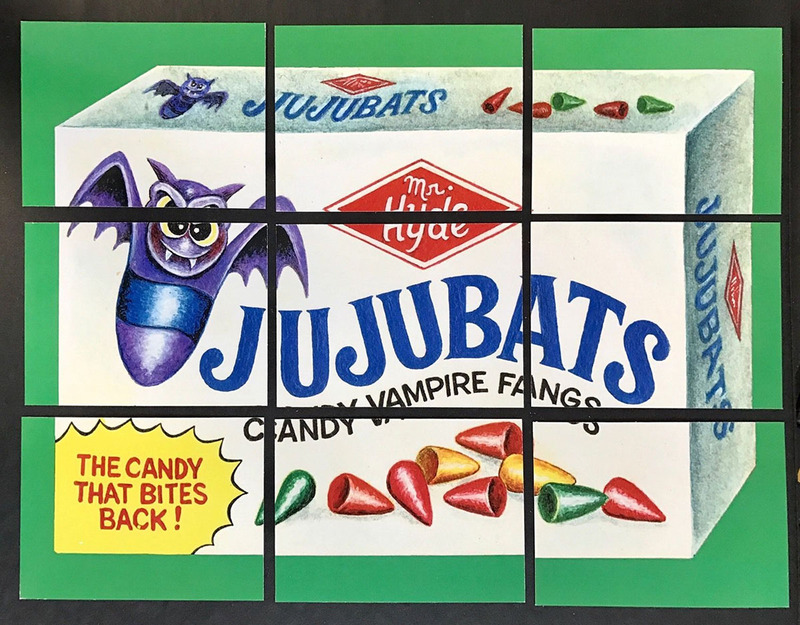 Only 120 sets were made. They still turn up but they go for hundreds of dollars. However it is possible to find various singles and puzzles, some of which are available here. LW1 sets are long sold out however we have a few singles available. There are 30 titles in the series, they were packaged in two packs with 15 stickers in each, one purple, one yellow. There were two bonus stickers not on the checklist, which were included in some packs. Red Veins and Ovary Show. The titles referred to as "v1" below are the original modified titles that were originally included in the purple/yellow packs. These titles had been (deviously) modified from the originals by two moles in the project. The "v2" are the replacement titles that came in the green pack, which was distributed to clean up the mess. The "v2" are the unmodified versions. 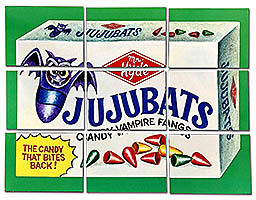 After the modifications were discovered, the "v1" titles were no longer put into the purple/yellow packs and all such packs contained the complete set of unmodified titles. Therefore it is possible to find purple/yellow packs with all "v1" titles and also with all "v2" titles. 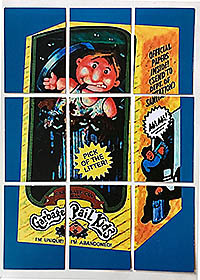 Additionally, some GPK-fonz variations found their way into both the yellow/purple and the green packs. 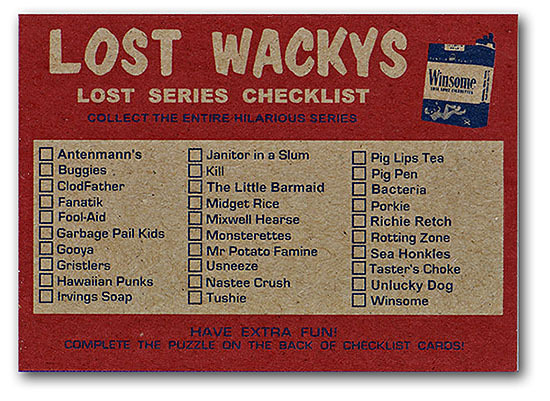 Three titles, Kill, Pig Lips and Porkies were considered lost wackys in 2005 when LW1 was printed. But to everybody's surprise, shortly after LW1 was printed the 1981 Test Irish series came to light, showing that at least in extremely limited quantities those titles had been published. It can be debated whether these therefore qualify as true lost wackys, or just "lost and found". 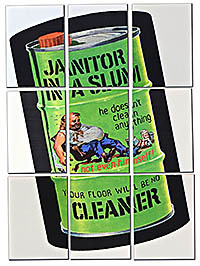 The main checklist puzzle was Janitor in a Slum. 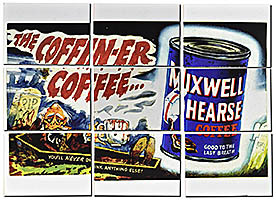 Three alternate puzzles were produced, Mixwell Hearse, Jujubats and GPK (remastered). The alternates did not surface for some years. In fact some of this stuff was supposed to be destroyed and some members did, but inevitably some amount of all variations have now been released to the community. To have more fun one of the team made a cheap Lost Wackys binder from a dime-store album with paper inserts. That turned out to be so popular that two high quality professionally made binders were eventually printed, in limited quantities. 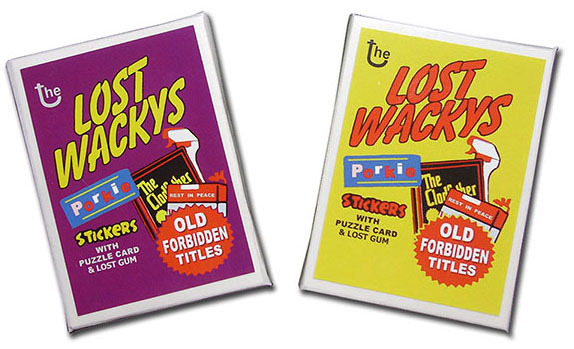 A fair number of proof and test items were generated in producing Lost Wackys series one. Different papers and printers were used, different wrappers and sheets were tested. Since these items have become highly collectible, we have assembled a master list here, so that people will know what is legitimate and what is suspect. If it's not on this list then it's probably not real.